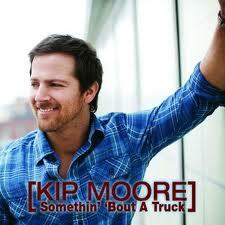 Two singles isn’t a lot of information to go by, but a couple of things about Kip Moore are becoming clear. First, he really is about as country as Bruce Springsteen. That’s a compliment. Springsteen’s working class ethos has more in common with country music greats of days gone by than anybody on the country radio dial today. Second, Moore sings with equal parts of authority, sincerity, and conviction. That’s what made “Mary Was the Marrying Kind” heartbreaking, and what makes “Somethin’ ‘Bout a Truck” invigorating. Sure, it’s a laundry list of the small town lifestyle, and we’ve had more than enough of those lately. But Moore doesn’t sound like he’s pandering. No, if anything, he sounds like he’s reveling in the pleasures that await him at the end of the week after forty hours at the factory. That’s a welcome change from those who sound like high schoolers who hit up that back country road on their way home from the mall. The first thing that struck me about this track is that it feels chorus-less. And that’s not necessarily a bad thing either. What really drives this track is the halcyon vibe Moore emits, in mentioning how a woman in a red sun dress, some time by the creek at two in the morning and, yes……..a four-wheel drive……….just really makes a day………and he wisely doesn’t try and explain why that is. You take his word for it……….because you can relate to how good he feels. This may be indeed a list song packed with stock descriptors, and yet it works……because it doesn’t try to explain anything or aim for anything more than it is: a pleasant, happy ode to quality time killing. Given, like I said, this is a single driven by its vibe rather than by a typical verse-chorus-verse-chorus-bridge-chorus structure, I don’t expect this to be a big hit for Moore. However, taking into account this single’s official video has racked up Brantley Gilbert-esque monster viewership numbers on YouTube, it is evident his major commercial breakthrough is imminent, and 2012 will quite likely be a great year for this rising star.